Former Sheffield centre Sam Smeaton says he rejected the idea of “chilling out” elsewhere in the Championship in order to try and force his way into Richard Marshall’s Halifax side. Smeaton, a mainstay of Daryl Powell’s successful Featherstone sides, left Sheffield after a single season, rejecting the chance to go full time with the Eagles in order to move to the Shay. And the 27 year old threequarter, who will do battle with Ben Heaton and Steve Tyrer for a place in the backline, admits he deliberately opted to avoid easier options. 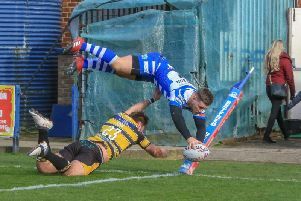 “I spoke to a few clubs, but Halifax felt like the best choice for me,” said Smeaton, who played in all the Eagles games barring one - their visit to the Shay - to confirm his recovery from a snapped patella tendon that had sidelined him for a season-and-a-half. “It’s definitely not the easiest option as far as getting in the team goes; I could have gone elsewhere, chilled out, put the cue on the rack and still been guaranteed to play pretty much every week. “But I spoke to my family and we decided that if I wanted to win games and get the best out of myself, this was the place to do it. “I know I’ve got to try and force my way into the side, which certainly isn’t going to be easy. “Ben’s a good player and I know all about Steve having played against him a few times over the years. “I had the option to go full time with Sheffield, and a few years ago I would have jumped at the chance, but I’ve got a young family now and, right now, it wasn’t the right option. “It wasn’t a simple decision; I’ve got more than myself to think about now. Two weeks into pre-season training, Smeaton is already focused on what he needs to do to win a place ahead of the pre-season opener against Huddersfield on January 10..
“It’s been good, so far,” he said. “Richard’s doing similar things to the stuff we did at Featherstone with Daryl; a lot of wrestle and a lot of skills work. “They’re a good set of lads and the new players all seem to be settling in. “For me, it’s about showing what I can do and after that it’s down to Richard. “I’d say I’m a good communicator, a good defender and my wingers have always scored tries. “I’ve had some good partnerships over the years - Zak Hardaker at Featherstone and Rob Worrincy at Sheffield - and if you can get a rapport going with players like that the team is going to benefit on the scoreboard.